One day I’m certain that I will begin a race report by commenting on how similar the most current event was to a prior one. Until then, I continue to find every marathon to be unique unto itself. From the course to the participants to my own level of readiness and performance, the only similarity from race to race has been the dissimilarity from race to race. Fortunately, Savannah’s distinctive features include many pleasant surprises and results that far exceeded expectations. 2. It’s no secret that I really enjoy interacting with other runners and supporters before, during and after marathons. Unfortunately, I am typically alone in this pursuit. 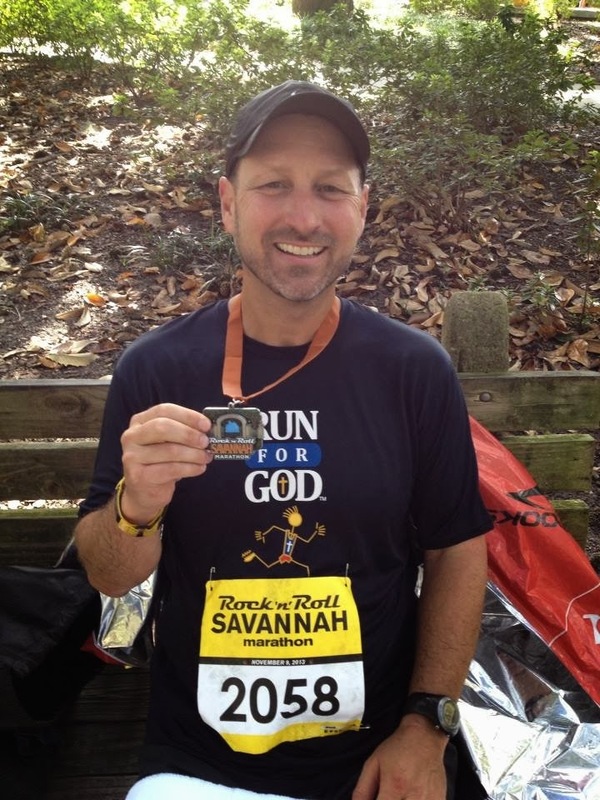 Aside from my first race at Disney in ’11, Savannah was the first time that my wife joined me for the event. And unlike Disney, here she could actually meet up with me at certain points, encourage and hand out chocolate! Yes, mile 21 and a couple of mini-Hershey's saved the day. It was nice to enjoy the experience and the weekend together. From a practical standpoint, in addition to the chocolate, having a ride to the starting line and a helping hand at the finish line, was really nice as well. I am hopeful there will be more shared trips. 3. The playlist was once again changed up. Eight marathons and seven different playlists (I went without music for one and will never do that again). For Savannah, I went all praise & worship and gospel (see playlist below). It worked. It really worked. 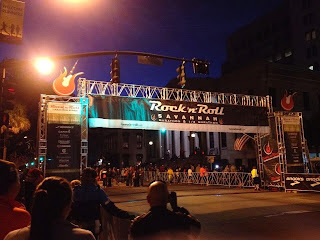 Several songs hit right at the key moments, and in particular was a revved up version of ‘I Saw the Light’ that came on about halfway into mile 25. Man, I needed that. Picked up the pace and cruised to the finish line. 4. Rock-n-Roll races are definitely heavy on the half-marathon. 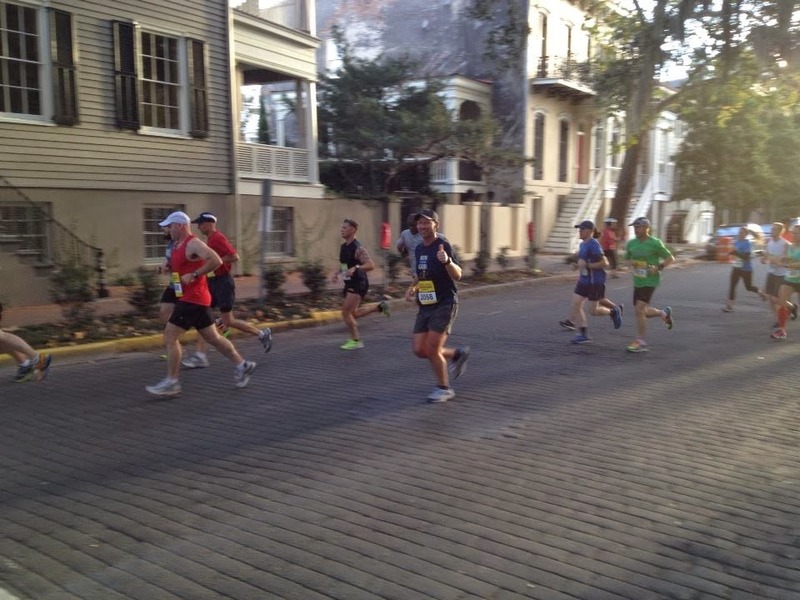 Of the approximately 18,000 finishers, there were just over 3,000 marathoners. I love the excitement and speed that half-marathoners bring to the first 11+ miles on these courses, but I found that miles 12-26 were not nearly as supported in terms of crowds, scenery, race officials, entertainment, etc. Not that we don’t put in a lot of lonely miles as it is, but it is a big difference if you were looking for 26 miles of the Rock-n-Roll vibe. 5. Surprised that I almost blew my pre-race ritual by delaying the trip to porta-jon boulevard. I found myself standing in line with 10 minutes until race time; not good for a maniacal planner type of guy. With my wife dropping me off in close proximity to the start, I cut it too close. I should have arrived 30 minutes earlier. That said, I made it to the corral, consumed my peanut butter GU and washed it down with 8 ounces of pre-race Coca-Cola, retied my shoes and took off my hat for the National Anthem. It was go time before I knew it. 6. 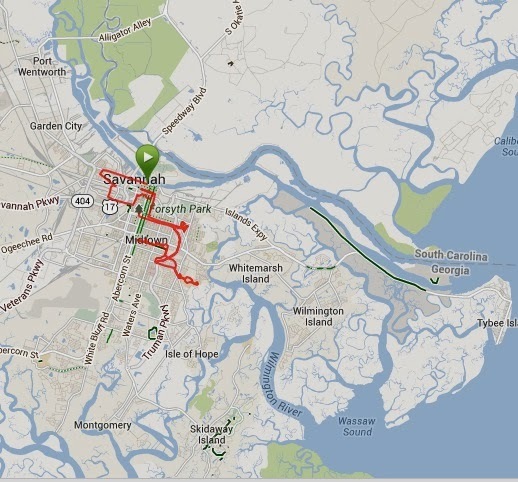 The course was flat, with the exception of a few overpasses, on/off ramps to overpasses and a beltway road in Savannah that had some elevation, but an even more debilitating headwind (especially trouble in miles 22-23). The course also seemed to be a blend of early stage industrial, mid-race neighborhoods and late stage campus' and parks. To me, the mix broke up the monotony somewhat and was enjoyable. 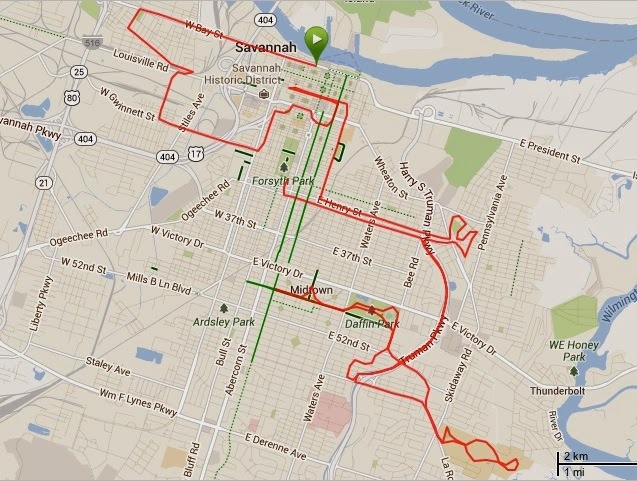 I particularly enjoyed running through Savannah State University. The marching band, cheerleaders and mascot were all out, and we even entered the stadium and ran around the track for 3/4 of a loop. Ultimately, the finish in Forsyth park is a great finish. A slight downhill for the final 1/4 mile is always a good thing, and the park worked really well for so many people. There was plenty of post-race refreshments and all was extremely well organized. In summary, over the past three years, I have attempted to train for a PR in the Fall and then run for fun the remainder of the year. So Savannah was my shot to break the 2012 Chicago time of 3:35:21. I trained for a goal of 3:29:59. Aggressive, yes, but I really felt it was doable. As race day approached, mostly out of a lack of confidence in my training plan and my diet, I adjusted my goal to 3:35:20 (to be honest, I actually started hoping to go sub-3:40) But thanks to a cautious early race pace, and the ability to hang on to some sense of control for 23 miles, I finished with a 3:31:13 and a very happy experience in Savannah. 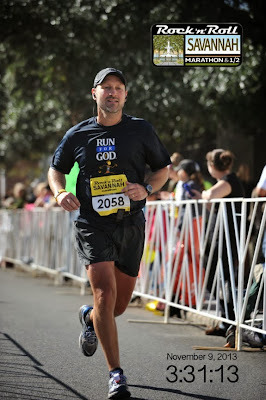 I specifically recall telling myself several times in the final two miles, “Self, you have two miles to gut this out. You can pull way back and your legs will feel a little better, but you will be so disappointed in your finish. Or, self, you can just keep going as hard as you can. It will hurt more, but you will have a much greater sense of accomplishment in the long run.” Every quarter mile I repeated this little internal monologue. And every quarter mile I decided to just keep going to see what would happen. On this day, I must have known what I was talking about, at least to myself.